Did Red Sox Really Low-Ball Lester With Initial Offer? Dave D'Onofrio is an award-winning freelance sportswriter who in more than a decade of reporting throughout New England has covered the World Series, city Little League championships, and just about everything in between. A Mass. native and a BU grad, his work also appears regularly in the (N.H.) Union Leader. 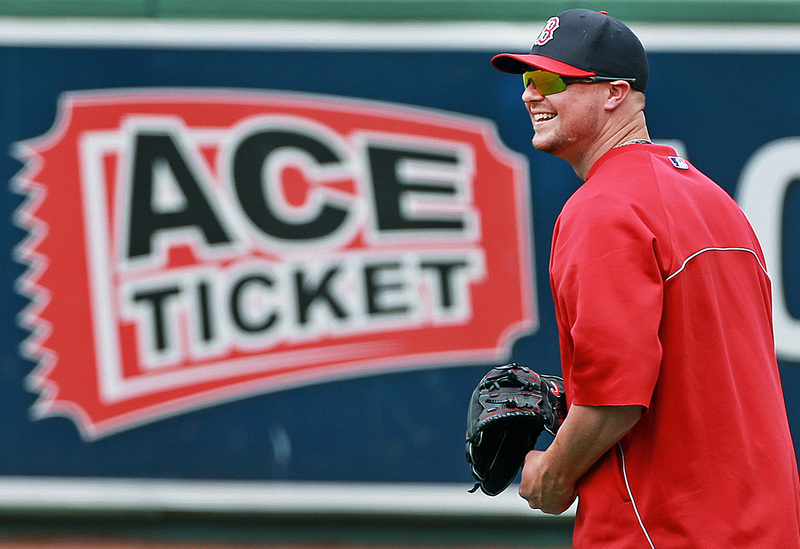 At some point, if not tonight then tomorrow, Jon Lester seems almost certain to be traded. After 13 seasons in the organization, after parts of nine seasons in the big leagues, after 241 starts, after 110 wins, after battling through cancer with the club's support, after pitching a no-hitter, after winning two World Series, after earning his way to three All-Star games, and after expressing a desire to stay in Boston "until they have to rip this jersey off my back,� Lester looks destined to be dealt for what is deemed to be the best available offer. To be an ex-Red Sox. To be the hope on which some new team hangs its aspirations for October. Those were the infamous terms the Red Sox reportedly offered their ace during spring training, and which were immediately cast as a slap in the face from the club to its ace as soon as Fox Sports' Ken Rosenthal revealed them. Lester had just yielded six earned runs over 34 2/3 postseason innings. He was still in his prime. The market had just seen Clayton Kershaw agree to a contract worth $215 million over seven years, and Masahiro Tanaka paid $155 million before ever throwing a major-league pitch. Based on all that, the Sox' proposal was widely declared to be something between a blatant insult and an exploitative lowballing. In fact, Lester's camp didn't bother to counteroffer, and negotiations apparently never again got to the point where years and dollar figures were exchanged. That's why it's easy to point to that offer as the beginning of the end of Lester's days in Boston. It's easy to forget now that Lester is two-thirds of the way through a career year, and all over the American League leaderboards. He's fourth in fielding independent pitching, fifth in ERA, sixth in strikeouts, eighth in strikeout-to-walk ratio, 10th in WHIP, to name a few -- but before this season, it'd been four years since Lester had ranked among the AL's top 10 in any of those categories. He wasn't among the 25 different pitchers who'd received Cy Young votes since 2010, which was the only season of his career in which he'd been considered. Over the two previous seasons his ERA of 4.28 was actually below average, according to an ERA+ of 97, and while that aggregate was obviously tainted by his brutal 2012 campaign, he finished the 2013 regular season between retiree Andy Pettitte and former Sox minor leaguer Miguel Gonzalez, 22nd in the AL with an ERA of 3.75. His WHIP of 1.294 ranked the same. And there were those questioning early in the second half of last season, after a terrible month, as to whether or not Lester would be worthy of a spot on the Sox' postseason roster. That isn't to discredit Lester's credentials. He has been very good for the Red Sox for the better part of a decade. His durability was evident in the 1,232 innings he'd compiled over the previous six seasons, and the quality of his contribution just as evident in the 3.65 ERA he'd delivered during that same span. He'd earned his status as his team's ace on a number of levels. But when the front office was sitting in Fort Myers, and comparing Lester to his contemporaries around the game, these were the facts. As good as he was in the second half of last season, and as unbeatable as he looked in the playoffs, if Lester deserved to be considered among baseball's true elite, he was on the fringes of that group at that point. And he'd just turned 30 years old. It was important for the Sox to gauge Lester's place in the game's grand scheme because they held exclusive negotiating rights with Lester until after the 2014 World Series. There was no market by which the value of Lester, specifically, would be established; there was only speculation, based on how Lester stacked up against other pitchers and what type of money they were making. As part of that speculation, the common supposition seemed to be that the Sox would get a better deal by signing Lester before he became a free agent and other suitors could drive up the price. This became particularly appealing over the winter, when Lester said on a couple of occasions that he'd be willing to accept something of a hometown discount. However, going back a couple of years, the evidence ran contrary to that logic. Since the start of the 2012 season, eight pitchers had signed nine-figure deals -- and only one of them (Zack Greinke's deal with the Dodgers) had been struck when the pitcher was peddling his services via traditional free agency. The outlier in the group is obviously Homer Bailey, who'd put up journeyman numbers over the bulk of his career, but is a couple of years younger than Lester, who had been better and more value than Lester over the two previous seasons -- and whose deal works out to an average of just $15 million per season if the Reds decide to buy him out for $5 million in 2020, when he's 34. Greinke's giant payday is one Lester could look at and make a case he's due more than $25 million per season. (So might have Max Scherzer turning down $144 million around the same time Lester was presented his half-that offer.) The numbers of Greinke and Lester aren't all that dissimilar -- however, Greinke had a Cy Young award on his resume, had two seasons better than anything Lester had delivered, and threw his first pitch for the Dodgers at age 29. Lester will be 31 when he begins his next deal. The other interesting comparison here is Anibal Sanchez. His former Sea Dogs teammate hadn't been nearly as durable, but the rest of the career numbers are darn close. And Sanchez was two years younger than Lester will be when he got $88 million to spend another five years with the Tigers. Lester is better than anybody else on that list, and deserves to be paid better. But none of the others got more than four years, or more than $52 million on the open market. So there's considerable space between that group and Greinke, let alone Sanchez. Look at Lester in comparison to this group. Look at what they got as free agents. Look at their relative ages. Look at what everyone had done over the two previous seasons. Look at the career numbers. And remember, Lester's career-year contract push hadn't happened yet. Four years, $70 million doesn't look ridiculous. It looks like a starting point. Red Sox principal owner John Henry has made no secret of the fact he's worried about the wisdom of committing major money to a pitcher after age 30 -- and while there are exceptions to everything, there are also enough examples to justify that belief from a business perspective. If that ultimately turns out to be the reason things fell apart between the sides, or the reasons the Sox don't make a serious attempt to sign Lester this winter, it's a reasonable explanation so long as they use the money elsewhere. And how might that philosophy have factored into the offer the Sox extended to Lester? Well, let's compare it to three other deals: the most-recent comparable free-agent deal (Sanchez); the most recent nine-figure extension (Bailey); and Adam Wainwright, who twice went against Lester in the World Series last year, after admittedly taking something of a hometown discount ($97.5 million over five years) to stay with the Cardinals when in a Lester-like situation last spring. What the Sox are trying to avoid is the situation the Yankees are facing with a broken-down Sabathia, the Phillies had hoped to wiggle out of by trading Hamels, and the Tigers have to be concerned over after Verlander's sub-par half-season. That leaves Greinke as the lone pitcher presently guaranteed more than $82 million from age 31-34 who thus far appears to be a sound investment. So, if we consider that pitchers have recently received more lucrative, longer-term deals by agreeing to contract extensions before reaching free agency ... and the established rate for pitchers who'd performed to Lester's level leading into this season ... and that Lester will turn 31 in January ... and that there's evidence to suggest teams all across the game are leery of paying boku bucks to pitchers pushing their mid-30s ... we may start nearing an answer to our initial question. Were the terms of the four-year, $70 million offer as egregious as they've been portrayed? If the Red Sox made a mistake, it was not being a bit more aggressive, and not getting nearer to a deal before Lester had a chance to change some minds by having the sort of dominant season he has delivered to this point in 2014. After four excellent months, the price has gone up. Just how much remains to be seen -- but part of Lester has to be wondering whether the six-year extension he agreed to during spring training of 2009 might ultimately cost him. If he'd already had a kick at the free-agency can, or if he was hitting the market at age 28 or 29, the conversation and the comparisons would be completely different. Age wouldn't be nearly as big an issue for the Sox, if it was an issue at all. Instead, this is the reality of the situation. And part of that reality is the Red Sox may not have botched this as much as many would like to believe.